International Journal of Research in Health Sciences,2014,2,1,309-315. 1-Assistant Professor, Department of Physiology, Institute of Medical Sciences and Research, Mayani, Maharashtra, INDIA. 2-Assistant Professor, Department of Community Medicine, Institute of Medical Sciences and Research, Mayani, Maharashtra, INDIA. 3-Professor and HOD, Department of Physiology, Vijayanagar Institute of Medical Sciences, Bellary, Karnataka, INDIA. 4-Assistant Professor Department of Physiology, Vijayanagar Institute of Medical Sciences, Bellary, Karnataka, INDIA. Material and methods: The present study was conducted on all 100 volunteers recruited from the student population of Vijayanagar Institute of Medical Sciences, Bellary, belonging to the age group of 18-24 years from May 2008 to May 2009. Baseline characteristics of all subjects were recorded which includes age, weight, height, body mass index (BMI = Weight in kg /Height2 in meters), resting heart rate and resting blood pressure. Then, they were subjected to exercise stress test on treadmill as per Bruce protocol. Independent-Sample T-test was used to find significant difference between the subjects with and without parental history of hypertension. Results: Mean heart rate was significantly higher in male subjects having family history of hypertension across different stages of exercise except in stage-1 (heart rate 1). Mean systolic blood pressure was significantly higher across all stages of exercise whereas mean Diastolic blood pressure was comparable between the two groups. Mean heart rate, systolic blood pressure and Diastolic blood pressure were significantly higher across all stages of exercise in female subjects having family history of hypertension except peak heart rate (heart rate peak) which was comparable in two groups. Conclusion: important finding was that those with a family history of hypertension had a higher heart rate, systolic blood pressure response across several stages of treadmill exercise. In female subjects, in addition, diastolic blood pressure was also significantly higher in those with family history of hypertension. 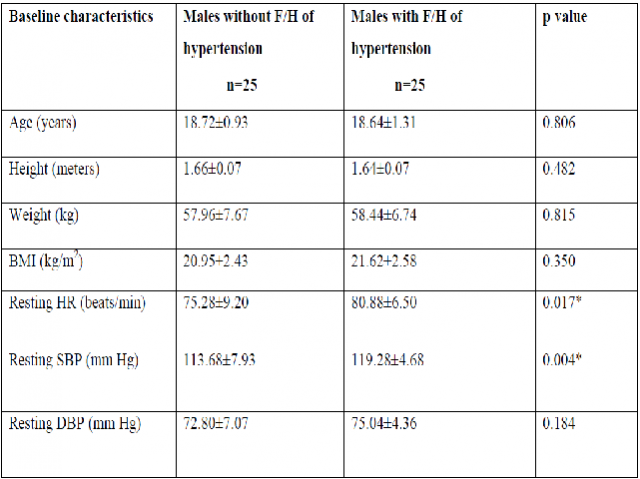 Baseline characteristics of male subjects based on family history of hypertension.